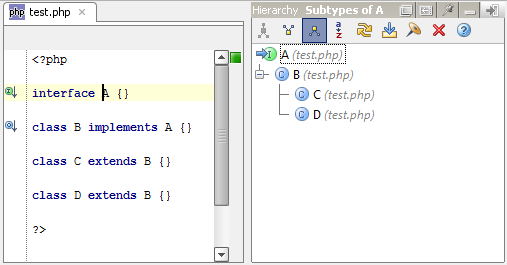 The Class Hierarchy action works in WebIDE for PHP sources in the same way as for Java. Just place the caret at any type in the code editor and press Ctrl + H.
Method Hierarchy View opens via Ctrl + Shift + H shortcut if the caret is placed at any function name in the code editor. 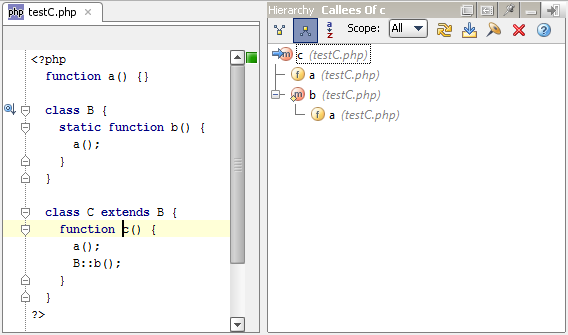 And the last type of hierarchies – Call Hierarchy also works for PHP sources via Ctrl + Alt + H shortcut.